“Hey, what’s that? It looks like a bottle on the beach,” said an excited nine-year-old named Simmi Árni Sigurgeirsson, as he strolled with his father and brother along the beach near his home in the summer of 2007. It was a section of beach in southwestern Iceland that Simmi had visited regularly with his family. As they approached the brown bottle lying tangled in kelp and flotsam, Simmi noticed that the bottle was corked and sealed, and appeared to have a message inside. Little did he know that opening that bottle would change his life. The bottle Simmi found had begun its ocean journey more than two years earlier, on July 31, 2005, approximately 100 nautical miles east of Baffin Island, and most likely drifted southwest with the Greenland Current, until it was picked up by the Labrador Current, carried south until it joined the North Atlantic Current, then started back toward Iceland. Inside the bottle were two letters. 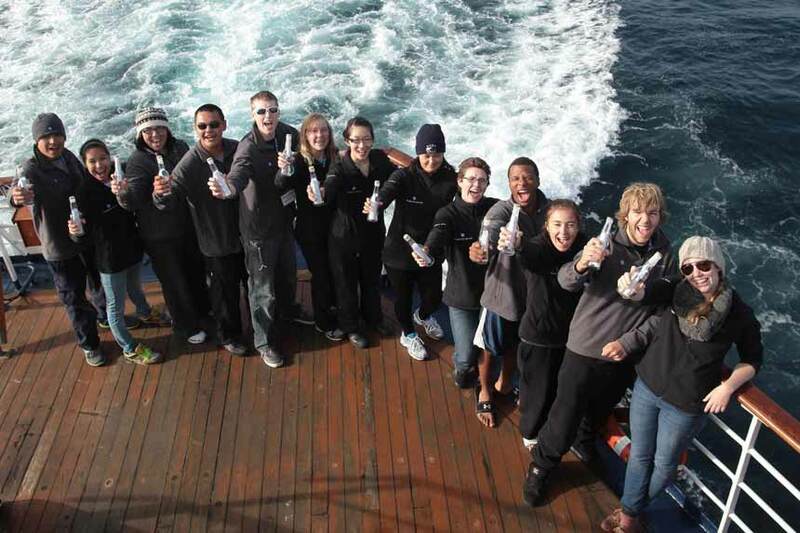 One was from the Institute of Ocean Sciences (IOS) and the Students on Ice (SOI) program, explaining that the bottle had been dropped in the Arctic Ocean as part of an ongoing ocean current study. The second was written by then 17-year-old Clark Groepper from Inuvik, Northwest Territories, who had dropped the bottle into the ocean. Two weeks later, we received an email from Simmi and his family explaining that they had found the bottle with the messages in it. Reading the email was remarkable, with all its details and even photos on where and how they had found it. Their excitement was palpable. Hello. My family found one of your drift bottles on the Snæfellsnes Peninsula, Iceland. More exactly, on the beach by our farm at Hamraendar, Breidavik, Snæfellsbær. This is close to the magnificent Snæfellsjökull Glacier, which was the entry point to the centre of the Earth in Jules Verne’s novel, Journey to the Center of the Earth. The bottle number is SOI-05-315 (please find the bottle message scanned in an attachment). There was also a handwritten message from Clark Groepper saying that this bottle was dropped somewhere between Greenland and Baffin Island in the Davis Strait. The discovery location is: N 64°48‘ 23,6“/W 023°35‘ 00,9. It was really remarkable that we found the bottle because the beach there is really large, many square kilometres of sand and cliffs and rocks. But the bottle crossed all the sand and was located just two metres from our beach fireplace where we use to make bonfires and BBQ hot dogs and marshmallows. A renowned Canadian oceanographer, Dr. Eddy Carmack, started the IOS Drift Bottle Project in 2000 as a contribution to the RCMP’s St. Roch II Millennium Project, when bottles were dropped along the west coast of Canada, around Alaska, and throughout the Canadian Arctic. The project was motivated by the successes of Dr. Curtis Ebbesmeyer, who has greatly advanced the science of ocean drifting objects. Drift bottles have long been used as an inexpensive (and fun) way to study ocean surface currents. A simple piece of scientific equipment, a drift bottle is an empty glass bottle with a watertight lid and a note inside it, explaining how to make contact with the research project. Project participants throw these bottles over the side of ocean-faring ships, and note the drop location of each bottle. When a bottle is found and reported to the project, the location information is added to a database for analysis. Students preparing to throw their bottles into the ocean. 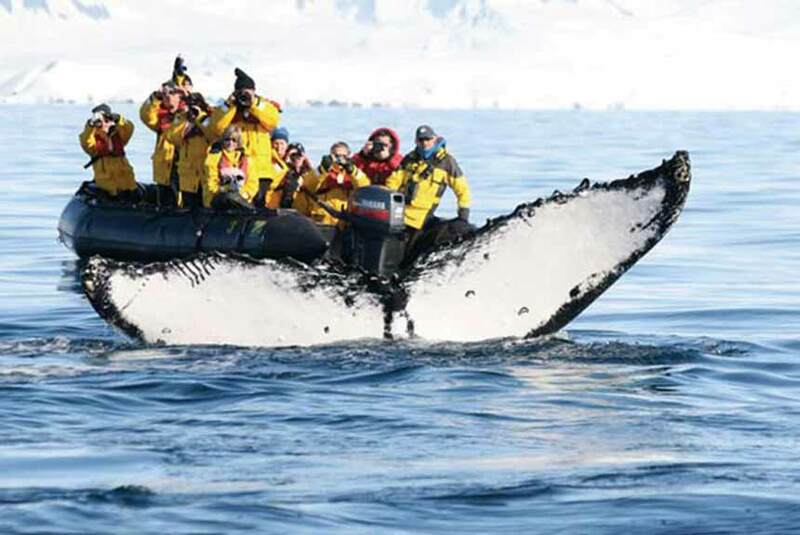 When I founded the Students on Ice program in 1999, Carmack was one of the scientists to volunteer as a member of the education team on our very first expedition. His passion and enthusiasm for the ocean was (and still is) contagious, and we soon started discussing the idea of using our ship-based educational youth expeditions to the Arctic and Antarctic as platforms for the drift bottle project, along with other research activities. 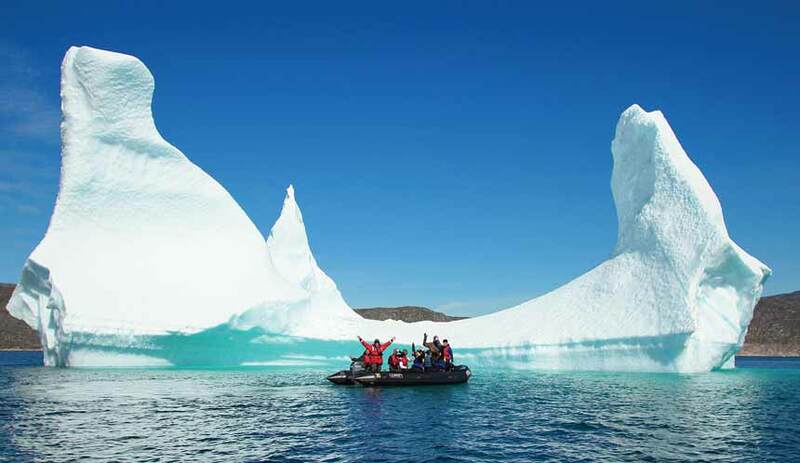 I must admit I was hesitant at first, but at the same time thought it might help our young explorers learn more in a hands-on way about Arctic Ocean currents and how they could be changing due to modern climate change. 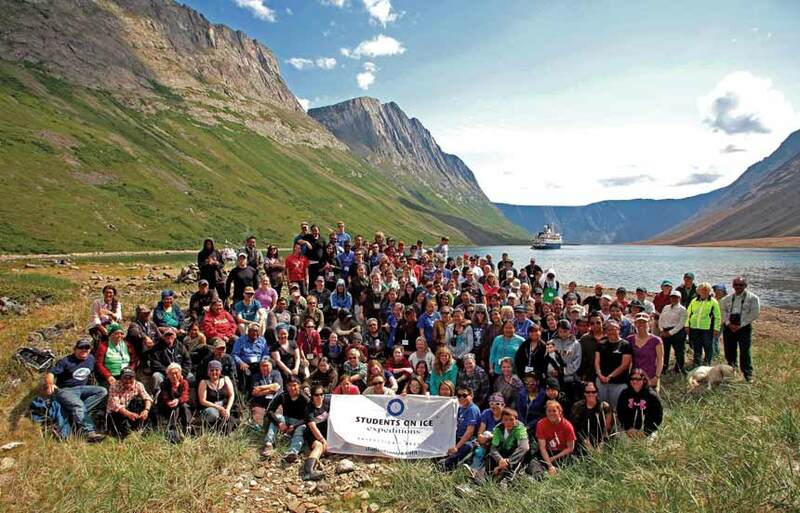 Our annual SOI expeditions typically take 70 high-school students and 30 scientists, educators, elders, musicians and artists from around the world on each polar journey. Every day is filled with adventure, discovery and learning about history, science, culture, flora and fauna, environmental issues and more. It is a powerful and transformational experience for the students, and thanks to many generous corporate, government, philanthropic and foundation partners, most of the students receive scholarships to fund their participation. Students on Ice (SOI) was founded in 1999. Since 2000, we have taken almost 2,000 students from 48 countries to the Poles. If I had to sum up the experience, I would say it is something that touches youth in their hearts and in their bones, helps them gain a great understanding of and respect for the global ecosystem, and gives us all cause for hope for the future. They come back motivated, educated and inspired to make a difference for themselves, their communities and the planet we all share. They are a generation of explorers who may not find new lands, but instead will make discoveries that help us find ways to better understand our planet and to live more sustainably on it. Putting messages into bottles is indeed nothing new. In fact, the first recorded messages in bottles were released around 310 BC by the ancient Greek philosopher Theophrastus, as part of an experiment to show that the Mediterranean Sea was formed by the inflowing Atlantic Ocean. Similarly, what has transpired with our Drift Bottle Project over the last decade of our expeditions has been an exciting testament to how everything on this beautiful planet is interconnected. Of the 1,900 bottles dropped in the Eastern Canadian Arctic Ocean since 2002, at least 70 have been found and documented. Some sink, end up buried in sand or undoubtedly wash up where nobody ever visits. The unfound glass bottles eventually break down and become part of the marine environment. 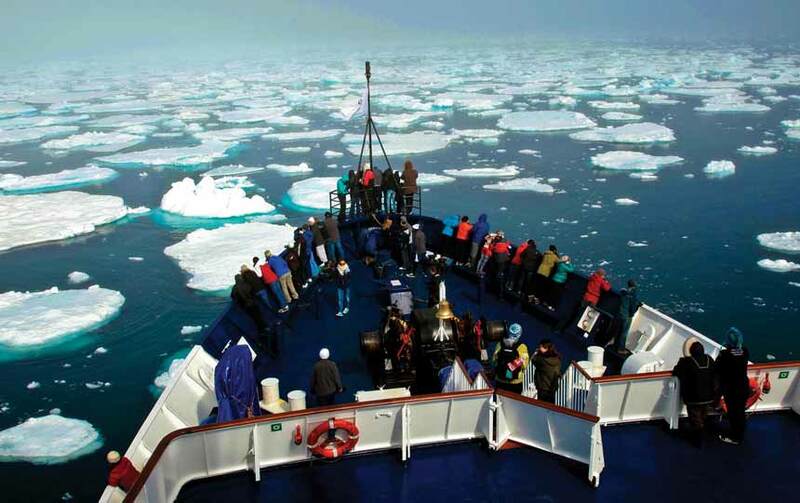 Geoff Green and participants from Students on Ice take to the seas to track ocean currents. Over the years, we started getting calls and emails from people that had found our bottles in places like Norway, Normandy, Shetlands, Orkneys, Ireland, Spain and Iceland. These bottles had travelled many thousands of kilometres, and results show they travel approximately five to 10 kilometres a day. In most cases, the bottles were carried south from the Arctic by the Labrador Current to the Gulf Stream, then eastward towards Europe. So far, nothing unusual has been discovered, which is good for all of us because changing ocean currents could have major impacts no matter where we live, not to mention on the global ecosystem. Yet the results are still important because they allow Carmack and other oceanographers to verify the theories of how currents—the world’s ocean highways—circulate and enable the detection of any changes to them. Participants in SOI gain an understanding of and respect for the global ecosystem. Within a few days I heard back from Simmi and his parents, who understandably had a few questions but ultimately agreed to let their son join our expedition team. Toronto businessman and philanthropist Donald Ross, and Icelandic businessman Oli Valur Steindorsson, generously stepped forward with the funding to make it happen. As good karma would have it, Simmi’s father was working part time for the president of Iceland, and immediately helped arrange a visit for our group with President Ólafur Ragnar Grímsson at his residence in Reykjavik. President Grímsson gave an impassioned speech to the students about how the future of the Arctic is directly linked to the future of the planet. His words resonated with all of us, and later helped inspire the students to create a Youth Declaration for the Arctic Council, which was personally delivered by Prince Albert II of Monaco to the chair of the Arctic Council. It was then tabled by Canada in November at the Arctic Council meeting in Lulea, Sweden. 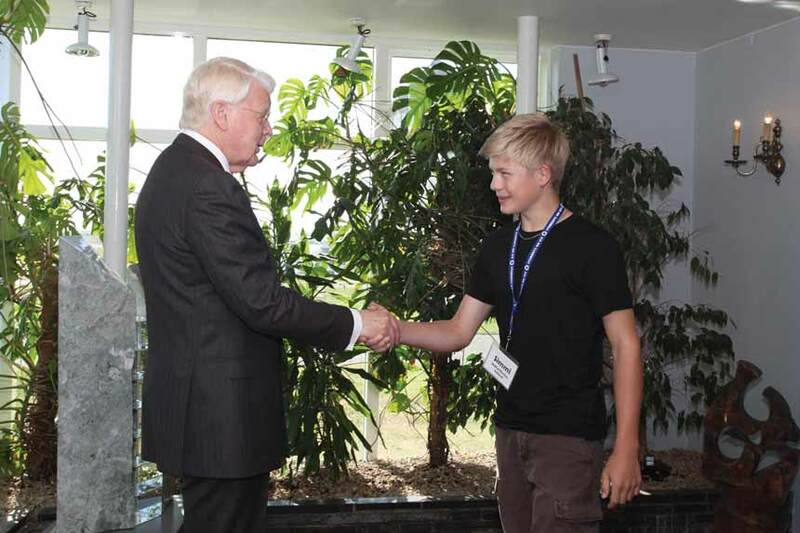 A very excited Simmi meeting Iceland’s president. In retrospect, my impulse to invite Simmi may have been because I had also once found a message in a bottle in the Arctic. It was during a visit to Coats Island in 2002, where I found a bottle half buried well above the high tide mark. It had been dropped in the ocean as part of a drift study for the bicentenary of Guinness brewery in 1959! The finder of the bottle was supposed to call Guinness to receive a prize. Unfortunately, by the time I called, the deadline had expired by 40 years. The bottle now sits on my desk, and serves as an inspiration even as I write this story. A few days into our 2011 expedition, as we were crossing the Denmark Strait toward southeastern Greenland, we encountered a pod of blue whales. The animals are the biggest creatures to have ever lived on Earth, bigger than any dinosaur, and are the majestic lords of the world’s oceans. It was the first of many life-changing and awe-inspiring moments that would transpire in the following days. Blue whales are the largest creatures on Earth. We also witnessed many examples of what I consider to be climate change impact, such as the day we sailed up a fiord in southern Greenland to see the massive Greenland ice cap. According to our navigation charts and recent Google Earth satellite images, our ship should have been sitting on top of a glacier, rather than floating in open water. On day five of our journey, the time eventually came for Simmi to drop his bottle in the ocean. He had carefully corked and waxed it, hoping that it, too, would reach some distant shore in the years ahead. I don’t know what he wrote on the personal note he placed inside his bottle, but maybe someone, some day, somewhere, will find out. And who knows how that simple, random discovery may alter their life’s journey.